FAIRBANKS — A fizzy, fermented drink that has swept the nation in popularity in the past few years is gobbling up sales almost as fast as producers can make it. The drink is kombucha, made by a simple fermentation process involving tea, yeast, sugar and basic science. It’s become so popular nationwide — retail sales reached close to $400 million in 2014 — that one Fairbanks business has started hosting classes teaching fans how to make kombucha at home. Jenny Tse is the owner of Sipping Streams Tea Company at 374 Old Chena Pump Road. She’s the woman behind the Fairbanks kombucha classes who teaches Alaskans how to make their own variation of the fermented beverage. She’s taught the class since 2010. She’s been drinking kombucha even longer. SCOBY stands for symbiotic colony of bacteria and yeast, and it’s the living culture that turns tea into kombucha through fermentation. It’s often called “the mother” in that it continues to grow and expand, similar to sourdough starter. 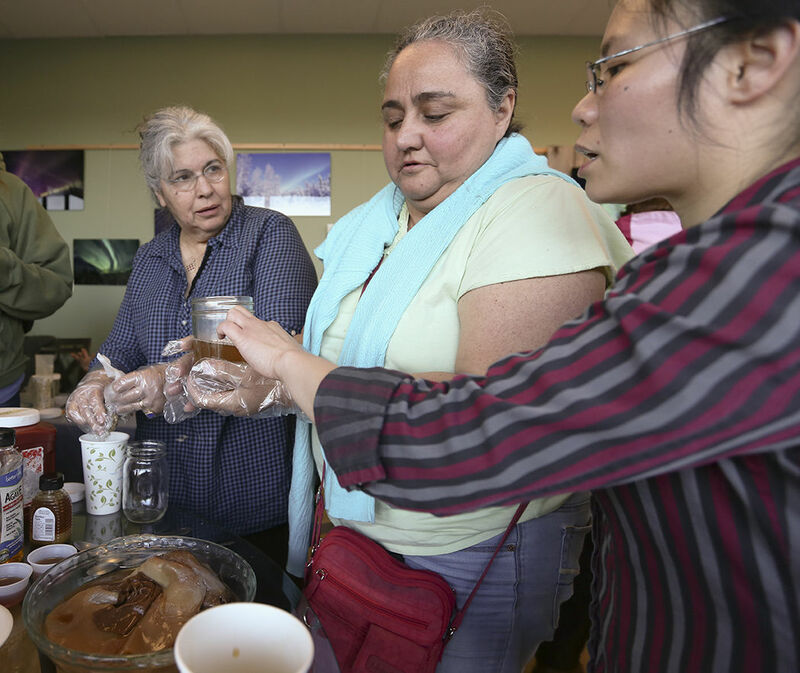 In the classes Tse teaches, she gives students a piece of her SCOBY, which she named Einstein, so students can make their own kombucha at home. Tse’s class lasts about an hour and covers a light version of the science behind the kombucha process. She touches on the materials needed and walks students through the process of creating the drink themselves. 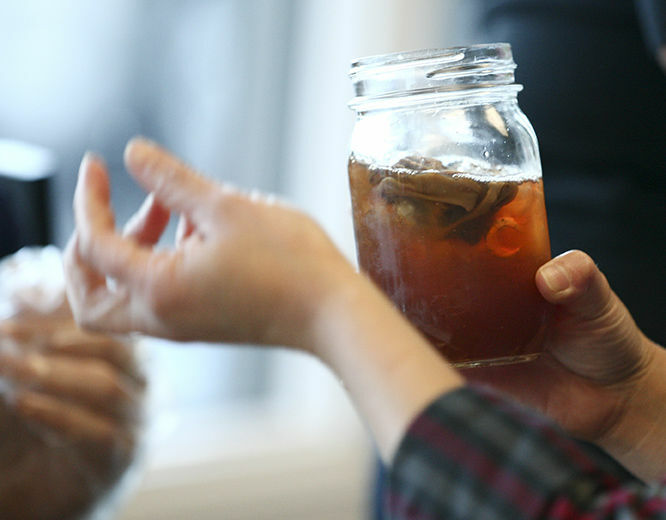 Participants pick out their own teas, are given the right equipment, and go home with a jar of tea housing a piece of SCOBY that in a few weeks turns into the tart, vinegar-like drink. Tse also gives students instructions on how light, temperature and oxygen effect the fermentation process. The class is informal in nature, allowing for a laid-back give and take of information. “It is a good way for people to understand it and see it at the same time,” Tse said about teaching the class. As a student studying sports medicine in college, Tse was already familiar with kombucha and drank an early version of what is now commonly sold in stores before it garnered retail popularity. Several years ago, she said, a friend loaned her a book on fermenting, and about the same time, a customer of the tea shop gave Tse a piece of SCOBY. Between the book and the SCOBY gift, Tse started experimenting with making kombucha herself. Now, several years later, she’s using her own SCOBY — Einstein — to enlighten others taken with the beverage. “I call it kind of grass rootsy, and that’s exactly how I got into it,” Tse said. The class also touches on the health benefits of kombucha, from probiotics to the natural acids created by fermentation, although Western medical science has yet to back the health claims of kombucha enthusiasts. Those claims can include joint health, improved digestion, cancer-fighting agents and boosts to the immune system. Tse’s next class on kombucha is scheduled for this summer, most likely in July, by which time Einstein, Tse’s SCOBY, should have doubled or tripled in size, allowing her to give a piece to students. For information on the class, look for Sipping Stream’s Facebook page at www.facebook.com/sippingstreams. Contact Features Editor Gary Black at 459-7504 or on Twitter at twitter.com/FDNMfeatures. Tea has taken over Jenny Tse’s life. Not only did Tse switch from drinking coffee to drinking tea, but she started her own tea business — Sipping Streams — selling teas and tea accessories, teaching a class about tea and staging tea events. In May she will be leading her first tea tour to Guangxi Province in China. 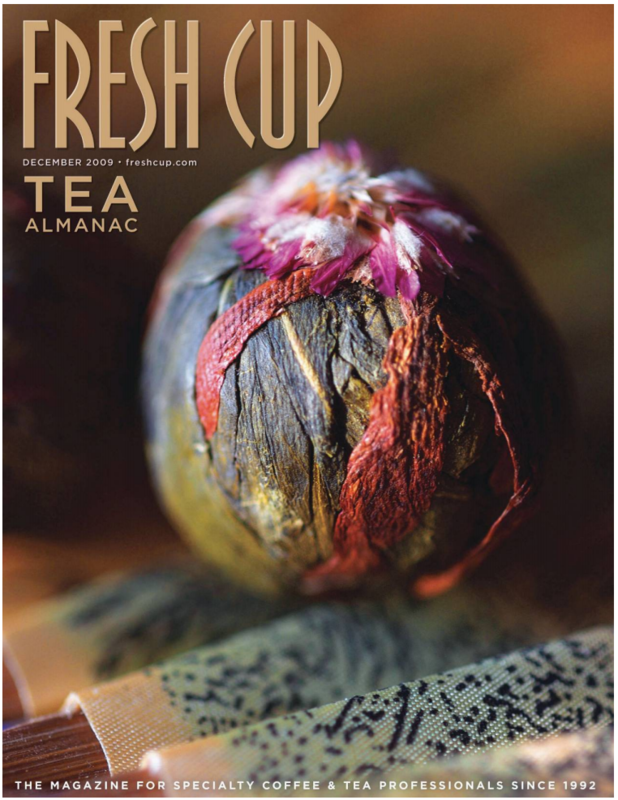 Tse’s interest in tea as more than a relaxing, nourishing drink started a few years ago. After returning home to Fairbanks from Boise State University where she had made the transition from coffee to tea, Tse sat sipping tea and pondering how to relate to her hometown community once again. As she looked around her family’s home she realized her family members were tea drinkers too. That’s when the dialogue began with her parents. “They started sharing their experiences of drinking tea when they were younger and growing up in China,” Tse said. Tea drinking inspired the conversations and excited Tse as she learned more about her parents’ past lives and Chinese culture. She also noticed that as she drank tea with others, they began sharing stories about drinking tea with grandparents and other inter-generational tea drinking experiences. Developing community around tea drinking is important to Tse and is one of the reasons she is pursuing her business part-time and is substitute teaching part-time. 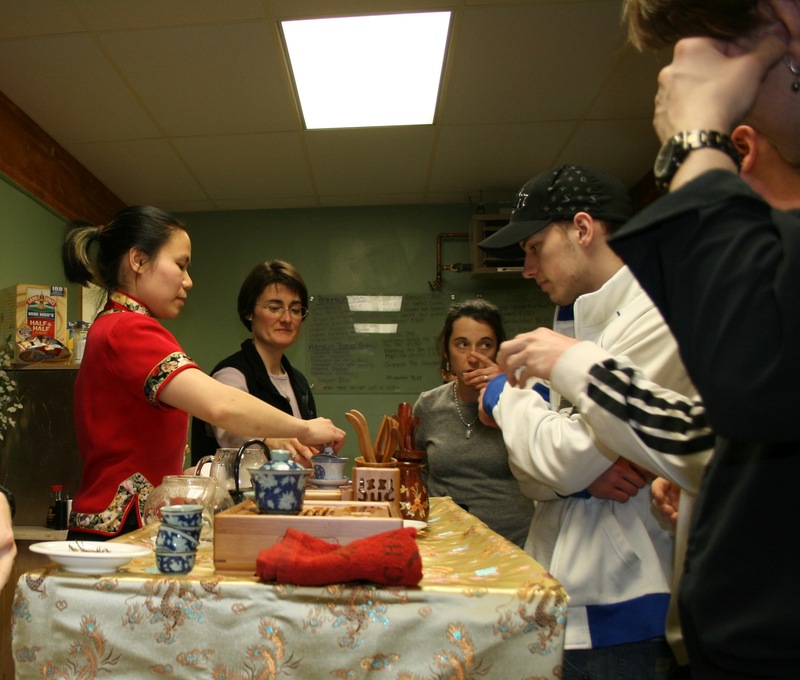 Tse has taken tea classes and continues to study the history and culture of tea around the world. She will be teaching a class on tea in April at the Tanana Valley Campus of the University of Alaska Fairbanks. Last summer, Tse visited Guangxi Province in southern China to learn more about tea and the people growing it. On May 11-25 she will be leading a tea tour there. Visit www.sippingstreams.com to learn more. The right temperature, right amount of tea, and the correct steeping times were some of the methods used by this year's Tea Infusionist Champion, a title bestowed on the "sommelier" of teas. There is a craft to brewing the perfect cup of tea, experts say, one that involves understanding the subtle alchemy that takes place when pouring hot water over delicate, fragrant tea leaves. 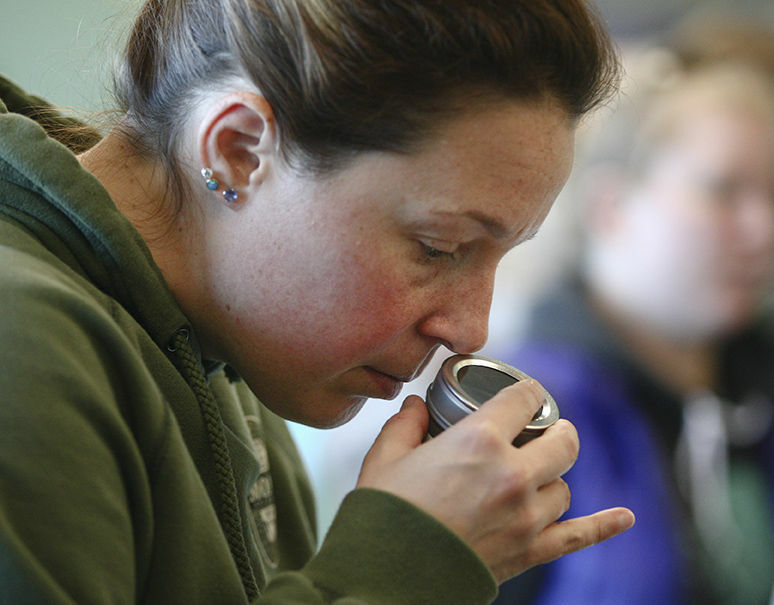 And the tea brewmaster who best understood this equation was Steven Downer of Sipping Streams Tea Company in the US state of Alaska, whose matcha was brewed at the right temperature, was the "perfect balance of water and tea," and gave off excellent aromas, judges said. Competitors were given 15 minutes to brew four cups of tea, including a Darjeeling, matcha, oolong and a puer tea from China. Cups were judged on the quality of infusion -- color, taste, smell and 'leaf agony' (the term used to describe how the tea leaves unfurl in agony once hit with hot water) -- and technical skills, like timing, volume and overall presentation. "It's not just about water temperature or steeping times," said Kim Jage, executive vice president of World Tea Expo. "It's about moving beyond the basics of tea. The contenders of the event, all tea experts, approach tea methodically and imaginatively; they embrace the tea's nuances." 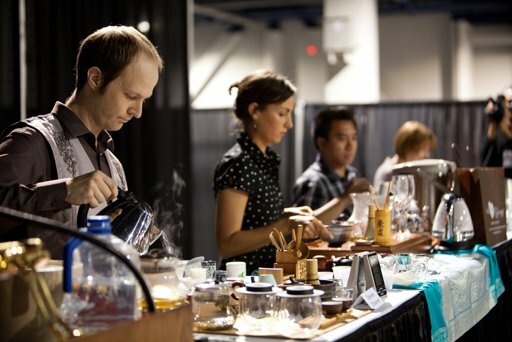 The World Tea Expo wrapped up in Las Vegas last week, and also awarded the best bottled iced teas this year. In the category of Ready-to-Drink-Flavored green tea, Snapple Green Tea came out on top, followed by Gourmetti Brands' Chaitea Passion Fruit. Numi's Earl Grey Pu-erh tea was awarded the top prize for being the best Ready-to-Drink-Flavored Black tea, and the Ready-to-Drink-Flavored sweetened black tea award went to Milo's No Calorie Tea Gallon. The highest marks were given for teas that were unique in flavor and for boasting a distinctive taste "with brilliant style." Meanwhile, in a bid to reduce the art of tea brewing to a science, the Royal Society of Chemistry in the UK created a formula they said resulted in the perfect cup. Among some of their more "controversial" recommendations, was to pour the milk in the cup first to achieve a color that's "rich and attractive." For optimum results, use a ceramic tea pot with loose tea. Tea infusion needs to be performed at a high temperature and that includes a pre-warmed tea pot. Fill the pot at least a quarter full of boiling water and keep it there for half a minute. Or, heat water in the tea pot in the microwave. Steep tea for three to four minutes. Add milk before pouring in the tea. The reasoning behind this is that the heat from the tea is liable to degrade milk proteins. The perfect drinking temperature is between 60 C (140 F) to 65 C (149 F). Any hotter, and this leads to the very uncouth habit of "slurping" one's tea. If the tea is too hot, an effective cooling method is to leave a teaspoon in the tea for a few seconds. 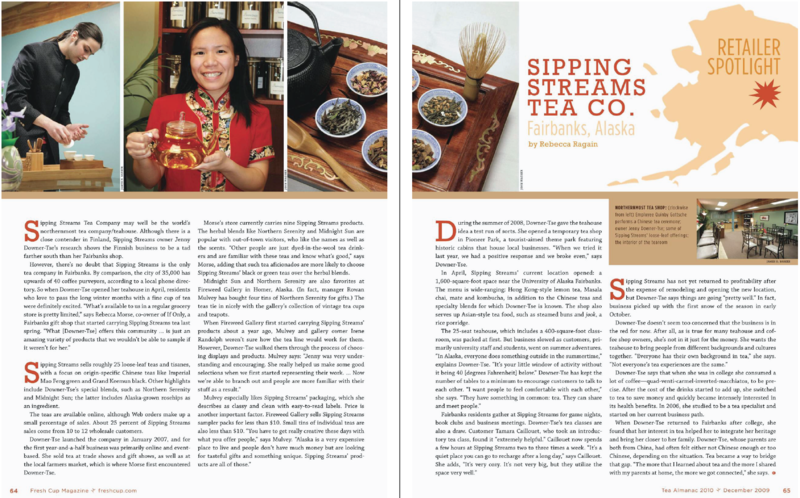 FAIRBANKS — Jenny Downer-Tse, owner of the new Sipping Streams Tea Company, loves to talk tea. 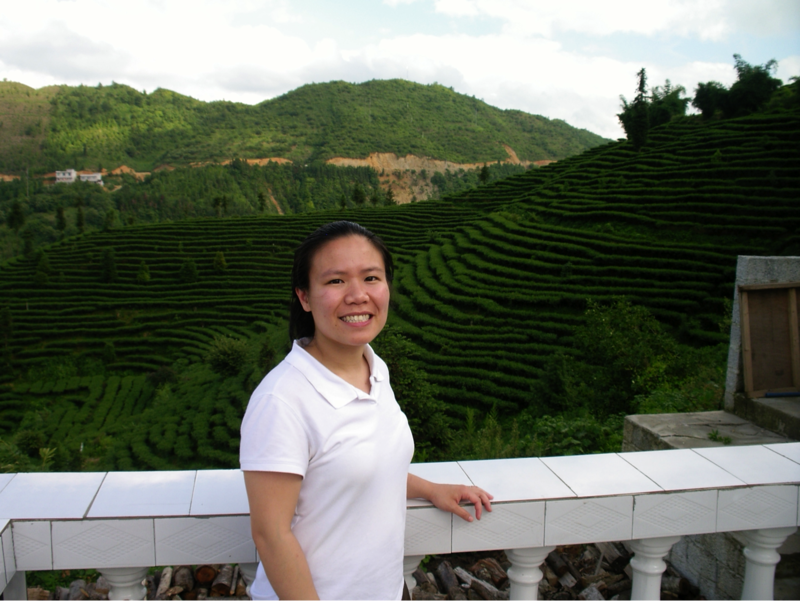 After traveling through Guangxi province in China, Downer-Tse has become a certified tea specialist and has opened a business with her husband to share her knowledge about the health benefits of tea. Off the top of her head, she can list almost every variety of tea, its origin, how to brew it properly and its health benefits. “Whenever I get really interested in something, I always feel the need to share it with someone,” she said of her new-found passion. Downer-Tse, who is in her mid-20s, has worked as a physical education teacher, an athletic trainer and a certified hedgehog breeder. After giving up her daily $5.28 quad-venti-carmel-inverted-macchiato coffee drink at Starbucks to save money, Downer-Tse said she struggled to keep the social lifestyle of sitting in coffee shops with friends. “Tea was the cheapest thing on the menu, so I started to drink that instead, and it brought back memories of my grandmother and grandfather and how they used to drink tea every day,” she said. Downer-Tse was born in Hong Kong and raised in Fairbanks. The new tea house, located under Wok N’ Roll next to Gulliver’s Books, is meant to serve as a cultural hub for Fairbanksans, Downer-Tse said. From Chinese tea ceremonies and Victorian tea parties to poetry readings, music lessons, lectures and tea-tasting, Downer-Tse said she wanted to create a place that emphasizes a healthy, simple lifestyle. Downer-Tse’s mother even added a few Chinese tea delicacy foods to the menu along with savory sandwiches, tea cakes and other edible goodies. Sipping Streams Tea is sold in several art galleries and shops in Fairbanks and North Pole. The Sipping Streams Tea Company opens at 11 a.m. daily and is located at 3535 College Road, Lower Suite B. More information about the health benefits of tea, the new store and other tea news can be found on the business’s Web site, www.sippingstreams.com.